A quince looks like the lovechild of a lumpy apple and pear - squat, with a golden yellow skin. In terms of taste and texture though, it's quite different. The outer skin is rough and woolly, and the flesh is pappy and astringent. Quince needs to be cooked to be edible. Quinces are an ancient fruit. Many think that it was a quince which tempted Eve in the Garden of Eden. The fruit originates from Iran and the Caucuses, but was already prolific in Europe by the Roman times - it was even thought that quinces were cultivated before apples. The first recorded quince in England was in 1275, when Edward I planted some at the Tower of London. 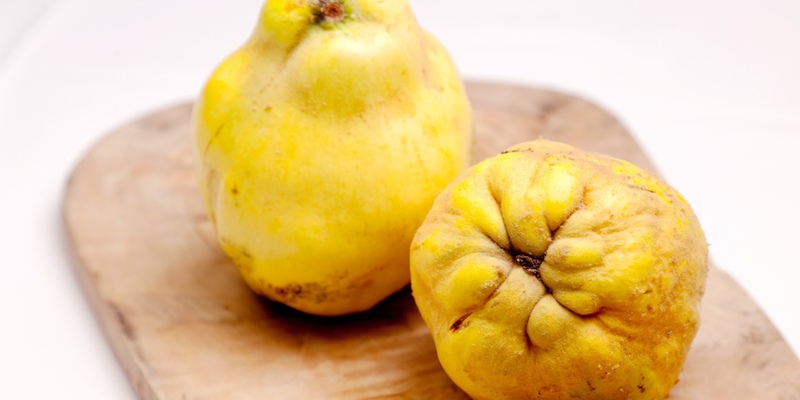 Although that was over 700 years ago, quinces still feel like an exotic fruit. Most British quinces are imported, indeed Turkey still produces over one quarter of the world's total quinces. Quinces feature in lots of medieval recipes, when it was very popular to sweeten meat dishes with fruit. It made even more of a mark on the continent though. 'Membrillo', or quince jelly, is still a national dish in Spain, when served with Manchego cheese. The Portuguese word for quince is 'marmelo' - indeed the earliest version of 'marmalade' was in fact a Portuguese recipe where quinces were stewed with honey. Quinces become available in October, where they are most commonly found in farmer's markets or well-stocked greengrocers. As with apples, quinces can be kept for a long amount of time if stored carefully. Keep them in a cool, dry place. Whether the quince is going to have a sweet or savoury application, they are often cooked with a little sugar or a drizzle of honey, and are often enhanced with a little spice - anything from a touch of cloves or cinnamon, to Chinese five spice. Because quince has high levels of pectin, it is a popular fruit for making preserves. Quince is known for making both jams and jellies. The shelf life of half-baked quinces can also be lengthened by storing them in alcohol or sugar syrup. Quinces are often used to enhance an apple sauce, an apple pie or crumble. The flavours are close enough that they complement one another, rather than distracting or overwhelming. Here, Geoffrey Smeddle uses quince alongside Granny Smiths, raisins and shallots to make a compote. As quince's season coincides with game, its little surprise that they are often partnered with anything from partridge to hare. Quince is also famously good for cutting through fatty, rich flavours - and is often paired with pork and, of course Manchego cheese.